Rubenerd: Quicken and Agenda: DOSBox to the rescue! 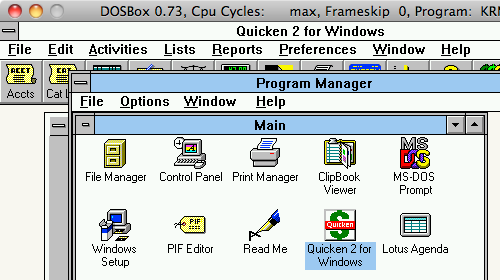 Quicken and Agenda: DOSBox to the rescue! This weekend I was helping a guy in Singapore who needed to use some an ancient version of Quicken for Windows and Lotus Agenda on his shiny new Mac. I instinctively reached for VMware Fusion to create a virtual machine, but it dawned on me there might be an easier way. A few hours later I had him using his software with only a tiny amount of overhead thanks to DOSBox! If you haven't read my raving about DOSBox by now, its a beautiful little cross-platform application that emulates a 486 class DOS computer complete with a fully usable command line, sound, input devices and graphics. Unlike other VM software you don't need to install a guest OS, and instead of using disk images you merely mount a directory from your existing hard drive. Too easy. Because it emulates DOS its capable of running most DOS software, including graphical environments such as Gem and early versions of Windows! In this case all I had to do was copy the setup files for Windows 3.11 into a directory on my hard drive, mount the directory in DOSBox and install it. From there I had a fully working Windows 3.11 install which I was able to install and run his old software in, and more importantly export his old data from. I think it's funny that what started as a hobby to recreate our old home computer from the early 1990s here has ended up getting me work on a few dozen occasions! Ruben Schade: Retro Software Consultant. I like the sound of that ^_^.